Are you wondering whether now is the right time to move your toddler from a crib to a big bed? While there’s definitely no strict timeline on when the transition should take place, around 18 months of age is typically when parents start to consider making the change. The trouble is, if you try to transition your little one from a crib into a big bed too early, it’s going to lead to weeks, if not months of sleep troubles. However, the good news is, there are signs you can look out for to see when your toddler is ready for the switch. Here, you’ll discover the top signs to watch out for that your toddler is ready to switch to a big bed. Of course, the easiest way to tell whether your toddler is ready for a big bed is if they actually tell you they are. It could be they want to sleep in a big bed like you do, or if they have older siblings, they may want to copy them. Whatever the reason, there does often come a time when toddlers do start to express their desire to sleep in a big bed. The difficulty here is that just because your toddler thinks they are ready, it doesn’t necessarily mean the transition will go well. Once you’ve taken away the crib, they may feel overwhelmed by the change. So, it can be a bit of a gamble, but generally speaking, if your little one does express an interest in sleeping in a big bed, it’s best to listen and consider whether they are actually ready or not. Once you do make the transition, there’s going to be no bars to keep your toddler in bed. This newfound freedom can be both exciting and daunting for a toddler. Initially they’ll likely be really excited to go to sleep in their new big bed. However, keeping them in bed can prove to be a real challenge! Of course, you can always install a safety gate to stop them from leaving the room. However, they will still be left unsupervised whether that’s in their bedroom or the whole house if safety gates aren’t installed. So, you need to ask yourself whether you’re comfortable, even with all of the childproofing you’ve done, to leave them unsupervised if they do get up before you do. The main sign your toddler is ready to move from a crib to a bed is they can easily climb out of it. This is a real safety concern, so unless you can lower the mattress to prevent them from being able to get out of the crib, you’ll want to transition them into a big bed. If you don’t make the transition and your toddler can climb out of the crib, they could end up seriously hurting themselves. Even if they’ve managed to successfully get out of the crib numerous times without incident, that isn’t to say they won’t have an accident one time while doing it. They could get caught on the bars, trip and bang their head or fall off the top of the crib completely. So, it’s much safer to make the transition once your toddler reaches this stage. These are the main signs to look out for that your toddler is ready to transition into a big bed. It’s worth keeping in mind that each toddler develops at their own pace so there is no real age they should be sleeping in a bed. However, most parents find it easier to make the transition once their toddler is around 3 years of age. One common reason parents consider transitioning their toddler from a crib to a bed is because they’re expecting another baby. It’s logical to try and free up the cot if a new arrival is on the way. However, it’s also not recommended unless your toddler has been showing clear signs that they’re ready to make the change. The trouble is, as mentioned earlier, transitioning too early can lead to all kinds of issues. You’re going to have enough to deal with once baby arrives, without the additional sleep issues you’ll face with your toddler too. So, rather than putting your toddler into a big bed and letting baby have the crib, it could be worth borrowing or buying an additional crib instead. This may seem like an unnecessary expense but it’s actually going to prove vital for your sanity! 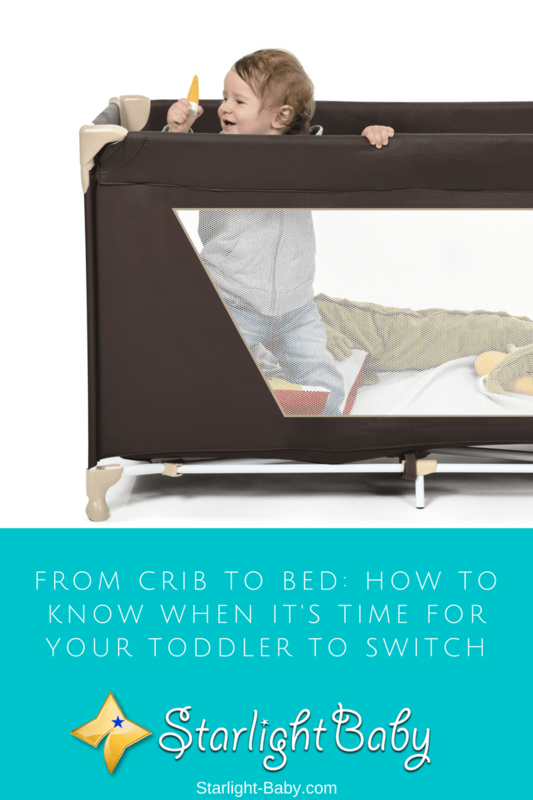 Overall, making the transition from crib to bed can be pretty traumatic for you and your toddler if it isn’t done at the right time. Always look for the signs your toddler is ready to make the switch. When did you know your toddler was ready to switch to a big bed? Share your story below! The baby asking for their own bed is a clear signal that they really want their own bed and this is something that the parents should always watch out for and try to do what they toddler asks of and not wave it aside as one of those playful attitude of the baby. Also, understanding and reading meaning into the baby climbing out of their crib is another key evidence that it’s time to their own bed ready for them. True. Parents must be in tune with their baby’s needs and not shrug off this need as something out of a whim. Toddlers do like to feel independent so parents should let them. Like when I was a kid, I always have the feeling to do some of the things by myself such as washing the plates that I used in eating and it was a fun scene then. Dear mom was understanding and allow me do some of those things. So, it is necessary to understand how your toddler feels when given a new crib or not. You are absolutely right about toodlers climbing out of their crib being a clear indication that they need another sleeping setting different from their sleeping crib. I know most parents are more comfortable with their kid sleeping in the crib because of the protective nature of the crib but once they grew tired of sleeping in it, there is no way to keep them sleeping in it. Yes, so true. You just can’t contain a baby in a crib if it has gotten tired of it. What’s worse, the baby could accidentally fall outside of the crib if he/she tries to climb out of it and no parent is watching over him/her. So despite the comfort and safety a crib offers, parents should accept that babies grow up and would want to transition into a bed. Toodlers constantly attempting or manage to climb out of their crib is the major sign that they are ready for the transition from crib to big bed of their own because there is literally nothing you as a parent would do to keep the toodler comfortable again sleeping in the crib. And care should be taken in making this transition fast because should the kid continue to try climbing out of the crib, the child might fall and get injured. I totally agree with you, Emmaz. My thoughts exactly. A toddler climbing the crib poses risks of injuries, etc. Parents should be very careful and keen. My son actually fell from his crib once but luckily for me and him as well, the tile floor has a form mat the crib was placed on, so his impact on the floor wasn’t that hard. Although, he fell with his arm but thankfully he didn’t break any bone. I took him for x-ray scan in order to be sure he didn’t sustain any internal injuries. Thank God your baby didn’t sustain any broken bones. I’m sure that scared you like crazy! So as I’ve mentioned in my comment earlier, this sign should never be ignored because the baby could fall out of the crib as he/she climbs out of it. There was a kid in my yard who fell from his sleeping crib from trying to climb out on his own and landed with his forehead, till date the boy is all grown up now with still a swollen head because the thing never went back in completely. Parents should be very careful with monitoring what is going on with their kids and sleeping crib. Oh my goodness! Poor child. I’m sure the parents still feel guilty for not closely monitoring their child back then. I love it when a toodler is adventurous, so when they show me signs of needing to explore other options when it comes to their sleeping locations by always trying to climb out of their sleeping crib, then it is the right time to introduce the child to a bigger sleeping bed of his or her own and see how he/she adapts to it. Yes, I totally agree with you. Parents should truly watch out for these signs and not set them aside.